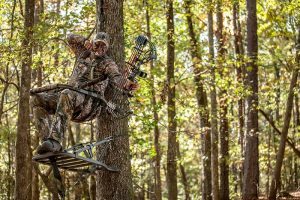 There is a wide variety of tree stands on the market and we’ve narrowed it down to the Top 5 bow hunting tree stands for you to peruse. 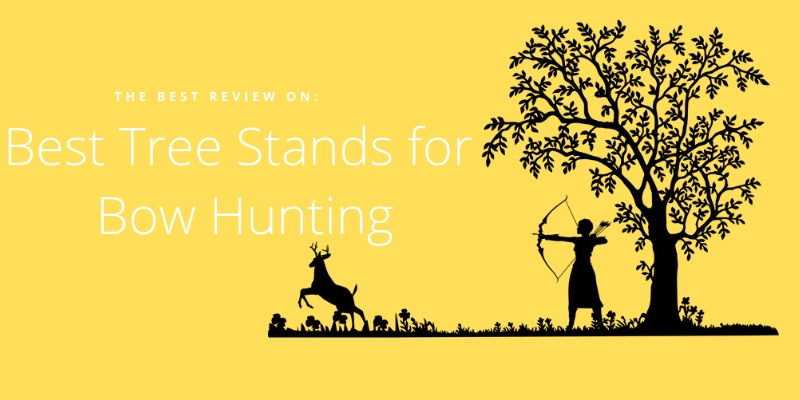 A quality stand is one of those bow hunting accessories which can make the hunt more enjoyable, safer, and at the end of the day, more successful. There’s a range of prices in this Top 5 bow hunting tree stands list so you can match your budget to one of the best and definitely get your money’s worth. 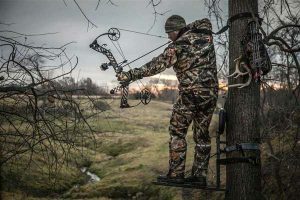 Climbing vs Fixed bow hunting stands – Which is better? Who Should Use Climbing Stands and Fixed Stands? 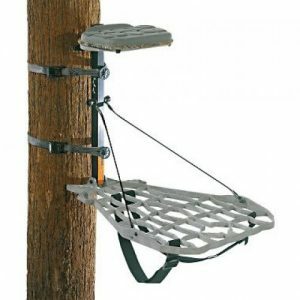 There’s a lot to like about this lightweight climbing tree stand. It packs to just 2.5 inches thick and is remarkably lithe at 14.5lbs. The cast aluminum platform offers a generous 4+ square feet of standing room, enough to give you the positioning and angle you want for the perfect shot. 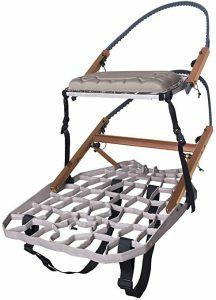 Other important features of the Alpha Hand Climber II Combo from Lone Wolf include the unique 3-D platform design for better secrecy, the bow holder molded into the platform, the backpack straps that make transporting it much easier, and the comfortably contoured padded seat with included fasteners. This tree stand fits trees with 6” to 19” diameter and is rated to 350lbs. This comfortable and sturdy stand features Alumni-Tech design that combines lightweight materials with rugged construction. The welded aluminum frame is very quiet and provides a secure 20×27 inch platform for mobility and comfort. The padded climbing bar, armrest, and adjustable seat make this a good choice for long days waiting for that premium buck to swagger into range. Other top features include the power-grip chains for trees from 9” to 20” in diameter, the folding footrest for climbing ease and comfort, traction ridges on the platform and the triangular extrusions which act to enhance strength while reducing noise. It includes backpack straps and a bag for your bowhunting accessories. The API Outdoors Grand Slam Extreme Climbing Treestand is rated to 300 lbs. Lone Wolf makes the list again, this time with a lightweight hang-on stand with 3-D camouflage platform and cast bow holder that fits most parallel limb compound bows. At just 11lbs, getting this stand to your hunting zone is easy, especially with the included backpack straps. Once you get there, the 14”x21” padded seat offers more comfort as you await your prey. The one-piece cast aluminum platform offers 26”x19.5” of room. A TMA-approved fall arrest system is included. The Assault II Hang On Treestand from Lone Wolf fits trees up to 22” in diameter and is rated to 350lbs. 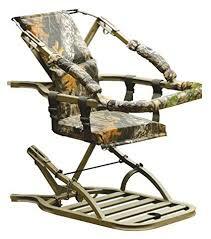 The seat on this Summit treestand is adjustable to fit your style whether bow hunting or gun hunting. Or remove the seat altogether if you’d prefer, with just a few quick steps. A solid front bar is useful for climbing and works as a padded gun and armrest. 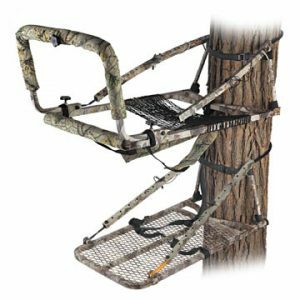 The Summit Viper SS Climbing Treestand package includes a 4-point safety harness, Rapid Climb stirrups and the ropes and straps you need to secure your stand to trees up to 20” in diameter. This stand is a bit heavier than most at 20lbs, but it offers a large 20×28.75 inch platform and comfortable padded seat that goes 18×12. The comfortable backrest is 12×20. The Summit Viper SS is rated to 300lbs and comes with a 5-year limited warranty. This is a deluxe tree stand, though heavy at 27lbs. 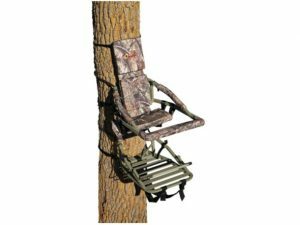 Still, if your trek from the truck to the tree isn’t too long, assisted by adjustable backpack straps you’ll have a very comfortable and roomy treestand to hunt from. The platform is 18×30 inches, the seat is 18×12 and the backrest is 12×20. This is a versatile stand with 2 accessory bags that can be detached to take with you. The steel construction accounts for the weight, and also the strength of the unit rated to 300lbs. Pivoting arm grips work well on trees from 8” to 20” in diameter. For quiet, comfortable stability, the Greyback 47027Climber Treestand from Gorilla earns a spot on our Top 5 bow hunting tree stands list for this season. Both types have their supporters and much of it comes to personal taste, agility, comfort level, and hunting conditions. In this guide, we offer an overview of how climbing stands and fixed stands work, then address the pros and cons of each one and end by suggesting who should use each type. Climbing stands grow in popularity as better designs make them easier and safer to use. Climbing bow hunting stands consist of 2 platforms, each with a brace that is opened, fitted around the tree, and re-secured. A seat or step below the bracket fits snug against the tree and when downward pressure is put on the seat of step, the tension holds it firmly in place. When the seat or step is lifted, the tension is released and the platform can be moved up or down. The hunter pushes the seat platform up and secures it against the tree, putting his weight onto it to hold himself. Using his feet, he loosens the lower/step platform and slides it up the tree. He stands on the step and moves the seat up again. In this way, the hunter climbs the tree in incremental, inchworm-like steps until the right height is reached for the climbing bow hunting stand. Fixed bow hunting stands are also called hanging bow hunting stands. They feature platforms that attach securely to the tree with the use of chains or straps. The back of the platform is usually straight or slightly curved to accommodate the curve of the tree. To hang the bow hunting tree stand, the hunter can climb the tree if the tree is suitable. Otherwise, a lightweight ladder or climbing sticks are used to hand and access the stand. Pro: Climbing stands don’t require you to carry a ladder or climbing sticks with you. They are preferred if you plan to move during the hunting day or reposition at night for the next day. This can be crucial when changing winds affect the value of a hunting location and a move is necessary. Climbers are often lighter and more portable than fixed/hanging bow hunting stands, with many of them sporting straps that allow you to carry them like a backpack. Cons: Some hunters aren’t comfortable with the climbing technique and don’t feel safe. Climbers require a straight tree without branches between the ground and where you want to locate. It is important to keep the two platforms connected with a tether so that if the platform being repositioned doesn’t hold, the tether and the platform still in place will catch you. Climbing bow hunting stands may slip on trees with shaggy bark that is easily stripped. Pros: Most hunters believe that stability is greater with a fixed stand that is properly hung. They offer more versatility in the type of tree you choose for hunting, which may be an advantage in finding the best location from which to hunt a deer trail or food plot. Many hunters find it easier to climb a ladder or use climbing sticks than to learn the required technique for a climbing stand. Cons: Fixed stands typically need to be hung prior to the day’s hunt to minimize noise and because they take more time to set up. Theft is common when fixed bow hunting stands, ladders or climbing sticks are left in public hunting areas, so chaining and locking the stand is recommended. Climbing bow hunting stands are best for agile hunters in good physical condition. They are also excellent for hunters who want to move during a day’s hunt. Climbers work well in new hunting territory where the hunter has not had a chance to select a hunting spot ahead of time. Fixed bow hunting stands are best for hunters who emphasize stability in the tree. They work well where the hunter knows exactly where he wants to hunt. Hunters in areas populated primarily with trees full of low branches will be able to use fixed bow hunting stands where climbers won’t work. This overview should help you answer the debate about climbing stands vs fixed bow hunting stands — which is better. As you read through the descriptions, pros, and cons the type that fits your style should become clear. If you still have doubts, borrow both types from hunting buddies ahead of the hunting season and try them out. That should answer any lingering questions you have about their functionality for you.